A-1 Haze feminized from Sagarmatha Seeds is a shining example of a superior haze. A strong performer both indoors and out, she grows with vigor, speed and grace. On average, she tends to grow anywhere between 0.75-1m in length. A-1 Haze serves up a rather potent stone, one that unashamedly mixes both Indica and Sativa elements. Absolute bliss! A haze that performs at the highest level, A-1 Haze from Sagarmatha Seeds is a marijuana strain that should be in everyone's personal collection. Truly a beauty to behold, she is peppered with crystal laden calyxes and a heavenly scent to boot. Very much a strain of complexity, A-1 Haze flourishes both indoors and out, boasting a flowering time of 65-70 days. This vigorous Indica-Sativa specimen grows to a rather compact 1 meter indoors, making her the ideal choice for those pushed for growing space. In terms of yields, growers can expect to receive anywhere between 300-350g/m² (depending on conditions). Once inhaled A-1 Haze quickly gets to work, inducing a soaring high of both comfort and longevity. The perfect pot for long conversations with friends. A-1 Haze's rich and authentic flavors swirl gently on the tongue, matched only by her deeply rooted aroma that further enhances the high. A-1 Haze is an absolute pleasure to grow and smoke, a real gem of plant. 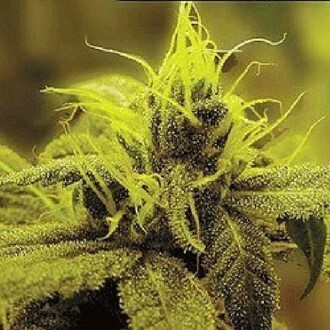 Even the most critical of cannabis connoisseurs couldn't turn down this 'budding' beauty.